More just in from Caroline Walters at Burgess as she sends news of a price reduction on the 29.13m sailing yacht Margaret Ann and a whopping €1 million drop on the 49.95m motor yacht Shandor. 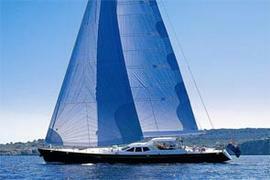 The 2004 Pendennis-built Margaret Ann is a 29.13m fast cruising sloop with graceful lines and impressive performance. Designed by Dubois, with interior design by Redman Whiteley Dixon, Margaret Ann has had one owner since her launch and has been consistently maintained to a very high standard. Below her teak-laid decks she accommodates six guests in three cabins and a crew of four in two cabins. She's classed to Lloyd’s and is MCA compliant. In 2008/9 she had an extensive refit that included a full repaint, a Lloyd’s 5-year survey and rig pull and is now down from £4.95 million to £4.75 million. Shandor was built by Schweers in 1985 and refitted in 1999 and 2008. Lloyds classed and MCA compliant, she has a classic John Munford interior and accommodates up to 12 guests in a master, two double and two twin cabins with two Pullman berths. This superyacht, the first true expedition yacht, offers the opportunity to explore the world in comfort and safety. She is one of the most seaworthy yachts of her size, is full of character and offers unparalleled deck and dining space - along with comfort and safety at sea. Shandor is now down from €8.975 million to €7.975 million.